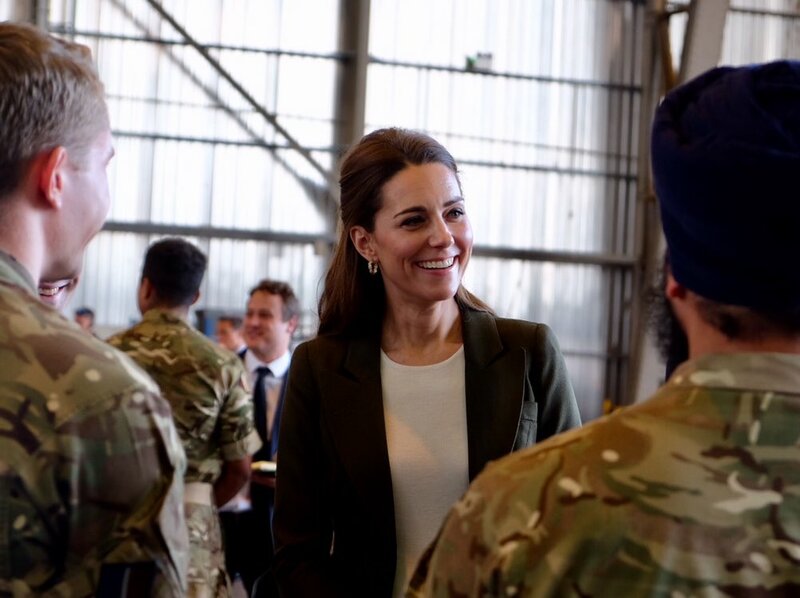 The Duke and Duchess of Cambridge visited Cyprus yesterday, spending time with serving members of the Armed Forces and their families. The Duchess looked regal and polished in a pair of smartly tailored trousers and blazer. Kate even brought a piece back from the archives for us, but balancing this nicely with a few new items as well. The Duchess wore her Smythe ‘Duchess’ blazer in army green, retailing for £576. This is much more a fashion blazer than a classically tailored piece you could pull from your wardrobe for years to come. The incredibly small patch detail on only one side of the blazer is adorned with a brass toned button and the square cut out at the rear of the jacket creates an uneven hemline; these interesting details are the more fashion forward elements of this one-button blazer. The blazer features exaggerated peak lapels, body conturing darts, welt pockets across the hips and four gold toned buttons at the end of each cuff. The rear of the blazer is constructed from one separate panel from the front and showcases a very fitted and form flowing cut to give a very feminine cut, not boxy and oversized. Too boxy can often leave the wearer looking masculine and with an ill-fitting blazer – we do not mean oversized like a boyfriend cut which is supposed to look loose all over. We first saw Kate wear this blazer in Canada in 2016. You can purchase this blazer here. Try this as a replikate, here. Catherine wore a pair of black wool crepe palazzo trousers. A very different look from the Duchess to see her wearing tailored trousers as she opts for feminine dresses on the majority of her engagements. The wide leg palazzo pants have a very distinct centre seam at the front, which is not present at the back. There is also front zip, and what appears to be a hook and bar closure, with a thin belt looped waistband. The rear of the trousers have not much detail at all with the absence of any pockets or darting construction. These currently remained unidentified with many theories being discussed in Royal Fashion circles on Social Media. The mystery remains, but we will update when we know more. We are not always fans of trousers on women for certain reasons, but the Duchess looks incredibly chic and perfectly put together. We like this as a nice change of pace to Kate’s wardrobe. Try these as an affordable replikate, purchase here. Kate wore her H&M white ribbed scoop neck top. This top has long since sold out. This is a basic, yet very versatile piece and can be a great quick go to piece when something is needed to be added underneath an outfit. We recommend you have a few pieces like this in your wardrobe! There was a new bag; the Duchess carried the LK Bennett ‘Dora’ Clutch in khaki suede, retailing for £175. The envelope style clutch is made from super soft suede and has a press-stud closure. The clutch has one large internal compartment and small zip pocket. A detachable strap gives the option of a cross-body bag. The clutch is currently on sale for only £119 and comes in a range of suede colour-ways, if you prefer these as an option for your everyday wardrobe, as khaki can be a hard colour for people to pull off. You can purchase Kate’s clutch here. Kate wore a new pair of matching Khaki suede heels. The Jimmy Choo ‘Romy 100’ in Olive Suede. These pointed toe, olive suede pumps feature a 10cm or 4-inch high stiletto heel. Many believe that Kate may be wearing Gianvito Rossi or LK Bennett pumps, however both the Rossi and the LKB’s have tan heel caps with the Jimmy Choo having black. The heels look to be Jimmy Choo and we know that Kate has been wearing this label of heels of late. Unfortunately these pumps are currently sold out, but the LK Bennett heels make a great replikate – get them here or try these cheaper ones here. Kate brought back an old belt that we have not seen for a number of years, since St Patricks Day in 2014. Then, she cinched the belt around her Hobbs coat. The dark green leather shiny croc-effect belt has an oversized rectangular gold buckle. This piece was never formally identified at time, so we don’t have any more information for you. Catherine opted for her Asprey London ‘Oak Leaf Small Hoop Earrings’, retailing for £5,000. These very fine delicately intertwined 18KT yellow gold oak leaves are inlaid with pave diamonds, totalling 1.34ct in weight. A very beautiful pair of earrings and a great twist on the classical hoops. The oak leaf features in the Duchess’ coat of arms, and you’ll remember her wedding earrings featured this emblem for this reason.